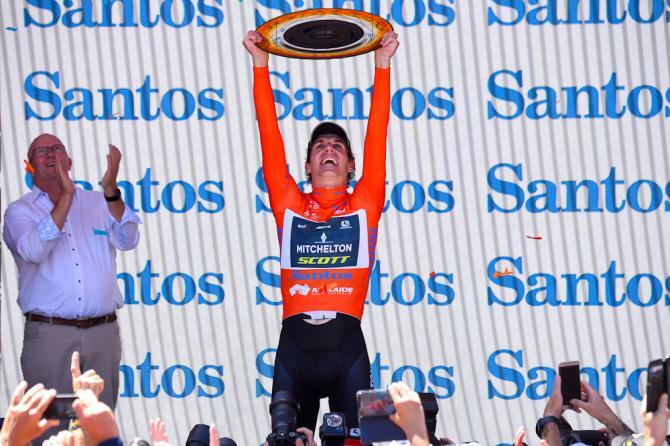 Mitchelton-Scott’s Impey, who won last year’s UCI season-opening event on countback, dug in to take this year’s general classification behind sixth-stage winner Richie Porte of Australia up the physically-demanding three-kilometer (1.9-mile) climb to the finish line. “I never dreamed to come here and win twice in a row,” Impey said. But even though Porte reigned supreme yet again up the hill, Impey did enough to finish a few meters behind him and Poels, to secure the race’s overall classification. “For me, to win six times up to Willunga is a great feeling,” Porte said. Bevin said he was feeling okay in the early part of the stage, but was quickly in trouble up the climb. “I was very sore to start with and then I didn’t feel too bad once we got rolling,” Bevin said. “Honestly, I was entertaining the thought of getting around. I had nothing to lose and I was going to go out and just hang on. 3. Daryl Impey (RSA/Mitchelton-SCOTT) s.t. 9. Tom-Jelte Slagter (NED/Team Dimension Data for Qhubeka) s.t. 10. Dries Devenyns (BEL/Deceuninck-Quick-Step) s.t.